Those were the days my friend. What really sticks out in my mind was making this for my Mom, Aunt Mary, and Uncle George along with some friends they met while we were all on vacation in California. Somehow the friends were invited over spontaneously for dinner, and they entrusted me, a very young me, to do the cooking. I’d made this before, but I couldn’t remember all the deets. Mom & I ran into town, stopped at a bookstore, looked it up, didn’t buy the book, lol, and then picked up the groceries. My Uncle was in charge of wine and was told (in California, no less) that there was no such thing as a white Bordeaux. I corrected him (and me all of 21 at the time, lol!) and off he went to a different wine shop, and somehow we all pulled it off…and we had a lovely dinner with good food, good wine, and good company. RIP to all of the older generation, now gone. I don’t know if I’m a good cook, even today. People tell me so, and they eat (most of) my food but I think what a really have is a knack for is finding or creating recipes that have what I call an “easy elegance” and/or recipes that coax the most flavor out of simple ingredients. Chicken Bordeaux from the New York Times Cookbook is one of those recipes that does both. When you get down to it, it’s just a skillet meal, chicken breast, a little pan sauce. Mushrooms and tomatoes. Wine. Coz a little wine never hurt anything, amirite? It’s the flavor explosion from all those things combined that makes this dish stand out. Now that I’m decades older, and know a lot more about food, I can see that this recipe also has a lot of downhome components that spark a comfort factor, too. You can see elements of the old standby, tomato gravy. Only it’s fancied up with the wine and the mushrooms. We’re having what I hope is the last hurrah of winter, another blizzard, so Chicken Bordeaux is a perfect recipe. The great thing about Chicken Bordeaux from the New York Times Cookbook is that none of the ingredients are expensive – they’re all pretty common. It’s just the way they’re put together that makes this seem all gourmet. You might have to search or ask (like my Uncle George) for that White Bordeaux. It’s not necessarily pricey. If you have to sub, maybe look for a Sauvignon Blanc. That grape comes from the Bordeaux region, too. Look for a Sauvignon Blanc with crisp rather than fruity flavors. I’ve talked a lot lately about chicken and how cheap it is right now, after Easter. Mushrooms I always buy on sale, often at holidays. Turn the package upside down and poke a few holes for longer storage. So let’s talk tomatoes: I’m a fan of buying larger cans of whole tomatoes and dicing, crushing or blending myself. They’re so much better than buying them already canned like that. If I only need part of a can, I’ll divide the larger can & freeze half. Look for sales with coupons and stock up at the low. An elegant but easy meal that straddles the line between comfort and gourmet. In a large skillet, melt the butter and saute the mushrooms. Add the garlic and cook for an additional minute, until garlic is fragrant. Remove and set aside. In the same skillet, heat the oil over medium-high heat. Season the flour with salt and pepper. Coat the chicken with the flour, reserving the remainder of the flour. Add chicken and brown on all sides. Cover and cook over low heat for 25 minutes, then drain the oil from the skillet. Push chicken aside and add the tomatoes, crushing as they’re added and tomato juice and heat through. Mix the water with the flour to form a slurry and add to the tomatoes in the pan, stirring to blend and cooking enough to thicken the mixture. Whisk in the wine, then add the mushroom/garlic mixture along with any juices they’ve let out. Move everything around to distribute evenly. Cover and simmer another 20 minutes or so, or until the chicken is tender. If the chicken breasts are the huge ones that seem to be more common today, consider dividing in half and serving half per person. I’ll be sharing Chicken Bordeaux from the New York Times Cookbook at Fiesta Friday #219, hosted this week by Jhuls at the Not So Creative Cook. Do stop by their sites when you have a minute – Fiesta Friday is a fun link up from some of the best bloggers and you’re going to fall in love with Juhl’s site! This entry was posted in Click here for Bargain Meals, Click here for Fabulous Food Posts and tagged Alcohol, canned tomatoes, Chicken, mushrooms, new york times, Tomatoes, Wine. Bookmark the permalink. Thanks Kamila!! Loved your post on favorite places to visit, btw!! Thanks, Jhuls, and thanks for hosting!! I think your changes would be great! The Chicken Bordeaux looks wonderful. You’re right – this is a comfort food. When I read the recipe, I realized that this is very similar to a dish that I make (minus the Bordeaux) from time to time that I don’t have a name for. I bet that’s lovely, too. 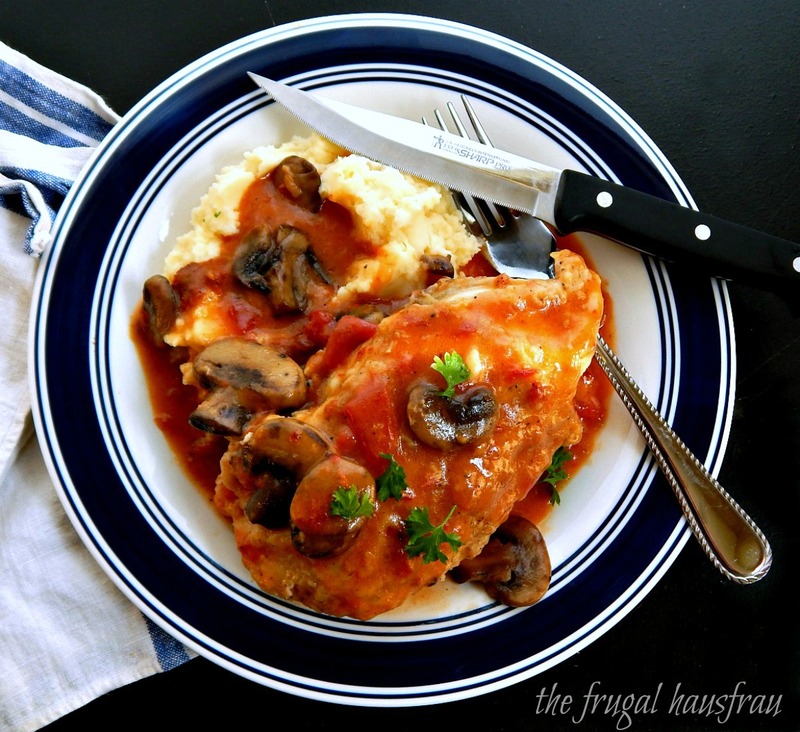 I have to admit the sauce over the mashed potatoes is my favorite part!! lol!! I am a huge fan of opening a bottle of wine and having a glass when I cook, too! This is a little retro, now that I think about it!! 🙂 It’s kind of a standard in my kitchen for “fancy” winter meals. Thanks for bringing this to FF. Looks delicious. Thanks much! Def a family fave! !